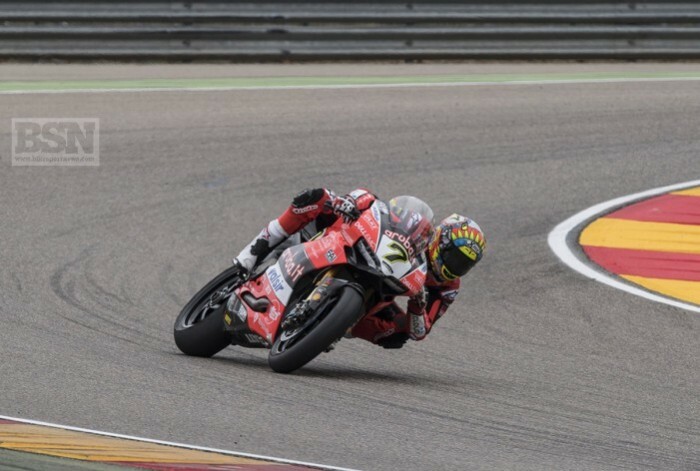 Chaz Davies’ fall in today’s WorldSBK Superpole two saw him starting the first race from the fourth row, but after a good start he was up to sixth on lap one and fourth on lap five. He finished second, overhauling his slowing team-mate Marco Melandri two laps from home and then Xavi Fores on the final lap – but only just after an epic tussle that went right to the wire. The last lap fireworks on an evenly-matched bike were thrilling to behold, even if it was for second and not the win. “That was a race and half, a good one,” said Davies after recovering from his morning mishap. “It was hard work and I am doubting my rear tyre choice. I am not sure if I made the right decision. For Davies anything but the ‘C’ rear may have worked more in his favour. His fight with Fores was a fiery end to a highly combative 17-lap race, shortened by one lap after a red flag after Leon Camier’s crash. Davies knew his last chicane initial pass on Fores had an element of risk about it. “It is quite hard to get it pulled up there and I thought he was going to come straight back by me on the back straight but I managed to square it. And at the end as well. It looked like a four way fight for the win with two-thirds gone but suddenly Rea moved on the pace and finally Melandri slowed, but Davies was already thinking that Rea had something extra. “I think Jonathan was managing the race a bit, and I never saw him really close, but I am pretty sure he was probably managing the race and putting together a few good laps. And, more than anything, a couple of good sectors. After a fourth row start on Saturday, Davies second sees him of the third row for race two, as will his race one podium colleagues Rea and Fores. Well known for his ability to come through the traffic, Davies is not keen on developing far-back starts as a habit. He had recent examples why, despite his good early progress in Spain. “My start was good but the first corner was better, as everybody pushed out a little bit,” said Davies. “The first couple of corners were really good. Staring from the fourth row is not perfect, not a good situation. I think it depends on the track if it determines the final result or not.